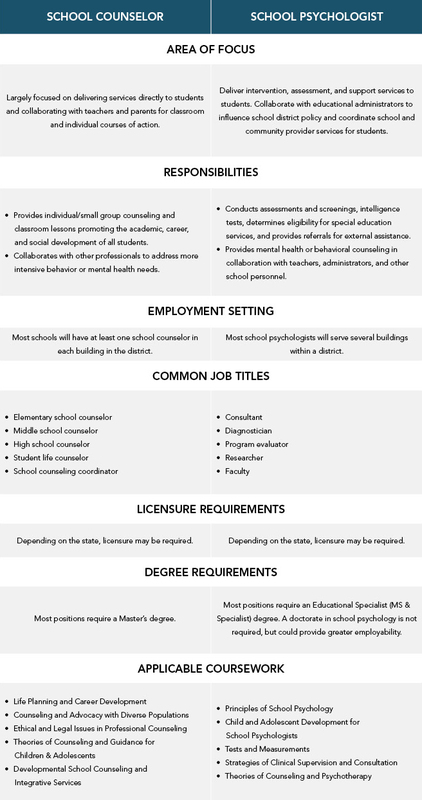 How are school counselors different from school psychologists? School counselors are largely focused on delivering services directly to students and collaborating with teachers and parents. School psychologists also deliver support services to students, as well as collaborate with educational administrators to influence school district policy. There is some overlap, as both professions work with students, parents, and school staff. But there are several significant differences. Here’s a quick guide to help you understand those differences as well as what career paths each can lead to. Capella offers a PsyD in School Psychology program and a CACREP-accredited Master’s in School Counseling program.